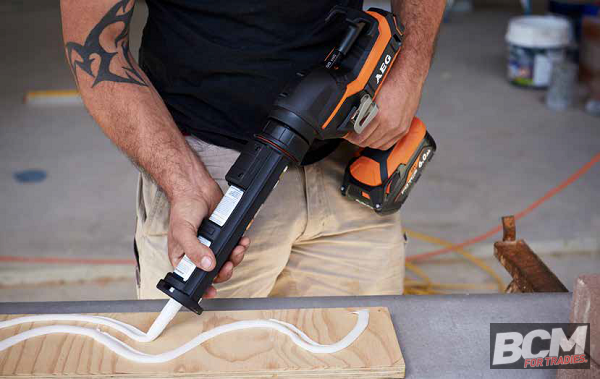 If you use a lot of caulking or adhesive the new AEG 18V Caulking gun is going to make your life a whole lot easier. The gun provides a powerful 4500Nm of push force so it handles tough compounds. Easily select six different speeds with the easy select dial under the trigger. This feature is one of the main reasons I opted for an electric caulking gun earlier this year. The beads are very consistent and it’s a lot easier to produce an impressive and professional finish. The added stability and control that is achieved when you don’t have to pump the compound out by hand is significant. A tool like this removes the risk of repetitive strain injury when you are on projects or tasks that require a lot of product application. When you get to the end of your bead the anti-drip feature retracts the caulking gun a little, which stops the compound continuing out when finished. This feature saves on product wastage and eliminates mess around your work area. 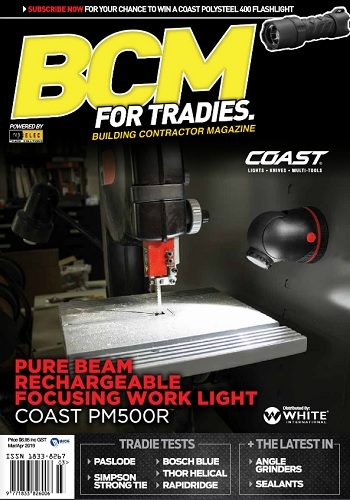 The quick-change rotatable collar allows easy change cartridges and also means you can change the angles of your beads without removing the nozzle from the work surface for a perfect corner bead. The AEG gun features both cartridge and sausage attachments, which you can swap over with ease in seconds. 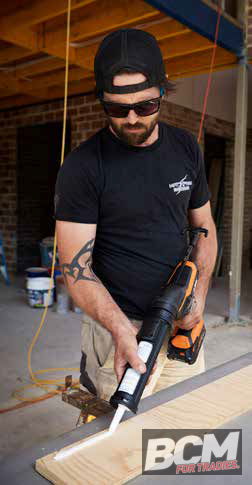 We tested the AEG in different applications from installing weatherboards, kitchen/ bathroom silicon, waterproofing stage of bathrooms, and many general adhesive applications. On our test bench we showed in different rows the speeds the compound came out, it’s consistency and how neat the beads were. They all came out perfect, unlike hand-caulking guns that show signs of where the trigger is reset. The AEG FORCE 6AH battery expels plenty of power for the day’s use so you won’t need to swap batteries. Alternatively to keep the unit as light as possible lower Ah batteries can be used to good effect. 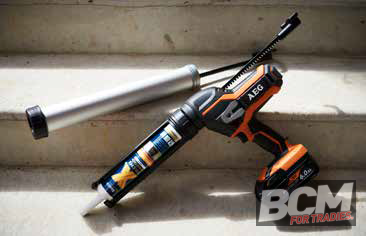 The AEG 18V 300ml/600ml Caulking Gun is worth its weight for an easily obtainable, professional finish. It’s not until you own one that you see how easy your life becomes. Better finish, less mess and more efficiency = more money in your wallet. I highly recommend you try one on your next project – you won’t look back.